It’s been a while – sorry. I won’t be about much over the next few months as I’m about to abandon Ashcotte and move lock stock and barrel down to Cornelian Bay in Tasmania where I have just purchased a lovely and grand decaying old house which will likely keep me poor for the next half a century. (Hannah chose the house for me and she’s already moved down.) Huge rambling (and similarly decaying) gardens and strange doorways in the house which lead nowhere. It will be fun exploring (as it will be similar fun being able to have my morning coffee on the beach). Once I’ve moved will put up an update. Here I am, arrived at Nonsuch and Cornelian Bay from Victoria. So much work to do! For the moment I have to concentrate on the house – the removalists arrive tomorrow, then in four short weeks’ time Martin Coman, the cabinet maker, is to arrive to fit the mahogany and elm cabinets in the library and office, and in the meantime there is electrical work and painting that is desperately needed. And the cats … I brought down our cats from Victoria as well, and one of the huge projects for the garden, as special to me as the planting and landscaping, is establishing a magnificent cat run that results not only in super happy and safe cats but also will blend into the background of the garden. Cats in Australia are increasingly controlled by councils in regard to their ‘freedom’ – in Bendigo we had very strict cat controls – but I love the cat run simply because it keeps the cats safe. For the moment they will get a small temporary run, the larger having to wait until the garden is landscaped. Unpacking – desperate. Lost a mirror. This is really niggling at me. How could I lose a mirror in the move? But lost it I have. In the meantime I can catch you up on the history of Nonsuch. Nonsuch is a Victorian house built in the mid 1880s. 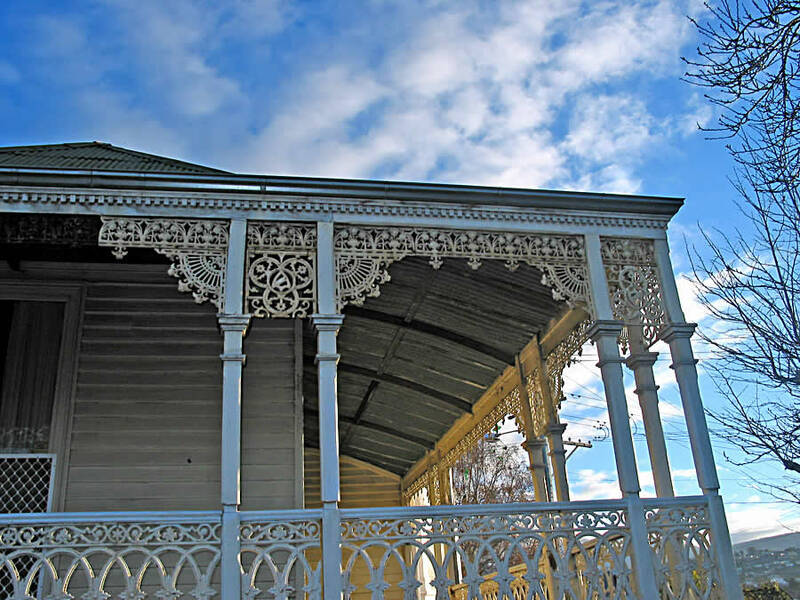 It is constructed of weatherboard with a timber shingle roof hidden under a rusting tin roof. It is a large, spacious ‘gentleman’s residence’, wrapped about with a huge verandah, studded with open fireplaces, and with high ceilings and decorative cornices. The outside needs painting and the tin roof needs replacing (I am not even going to think about trying to restore the shingle roof), and the verandah is sagging horribly. 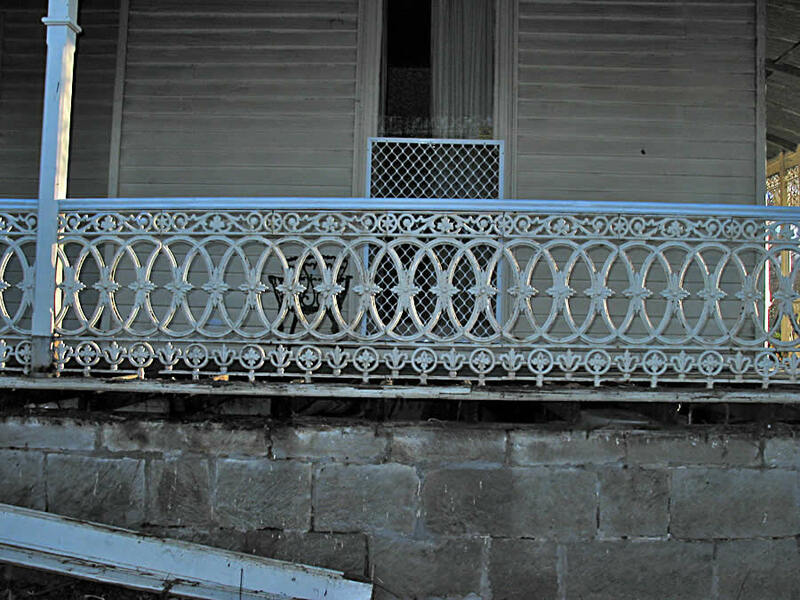 One of my first repair jobs must be the verandah – in the picture to the right it looks OK, but those floor boards and posts are rotten, and the iron work rusting away. The garden … the garden is one of the main reasons I bought this house. 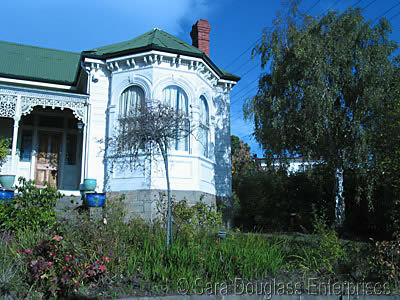 It is extensive – almost half an acre of grounds, which is amazing in inner city Hobart. The block slopes down from the back (south) to the front and it shaped rather like an arrowhead – the point at the front of the block. Currently it consists of much weedy lawn, some rotten stumps, a jungle in one corner (matted trees and shrubs, who knows what lies behind there), several old trees, and many overgrown and weedy planting beds. 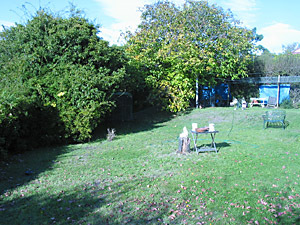 The view to the left looks up the block from a halfway point to the back line of the property where grows an ancient hawthorn hedge. To the left of the picture you can see a huge walnut tree – behind that is The Jungle and the Unknown. It may not look like it, but there is quite a slope on that lawn area. The cat run man has been also and fixed up the temporary run for the pusses – you can see part of the aerial walkway leading down to the enclosures under the walnut tree. And finally a picture of part of the front garden – showing many weeds, a very dead rose, and the ghastly paintwork and roof of the house. Oh, the wind here! Washing is dried within minutes! Snow on the mountain yesterday. Have had the most glorious series of sunrises and sunsets over Nonsuch this past week – unusually warm weather … no wonder so many of the spring flowering plants are having another go in autumn. Painters are here to touch up the some of the rooms; cabinet makers coming soon to put in my cabinets. Still no sign of the landscape contractor. Several hundred spring bulbs now potted out. No sign of the landscaper. The front rooms of the house have had their lick of paint. Very, very windy, and hardly any rain since I’ve moved down here. I think I may have brought the drought with me. Jack Cade and Cromwell still not with me, should be arriving in early June. Digger’s sent me their catalogue last week. Even though I shouldn’t be planting, I just can’t not order something! So I settled for several robinias (deep coral flowers) for screening the house two doors down (imagine, Victorian sandstone and they rendered it and painted it purple), comfrey shrubs for composting, a few hundred lilies, propagation trays, containers etc. Something to get started with. Much fuss. I have discovered that the house next door is actually built around a core, that core being the stable block which belongs to my house. I want my stable block back. And, may I add, the parcel of land it sits on. That darn landscaper. Must hunt him down. Why can’t he ring back????? Cabinet makers arriving tomorrow (all the way from the mother country – Victoria) to put in book cases and cabinets. Am waiting for the quote to re-roof the house. Much angst. 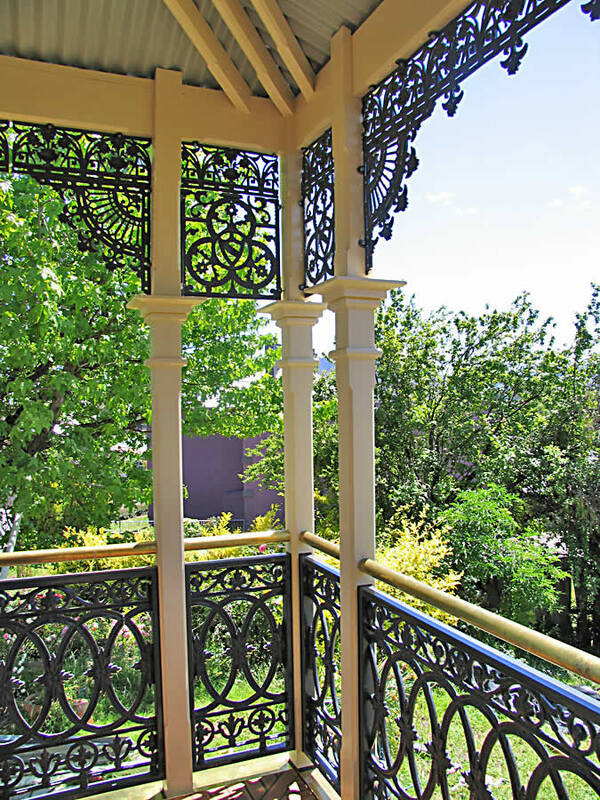 A surly man has been around, masquerading as a builder, having a look at the verandah. He’ll be back next week with his mate to start work on rebuilding the structure. Why do I feel this is going to cost me the earth? Very wet and rainy and cold. The garden is simply there, am doing nothing to it, and that nothing helped by the fact the garden landscaper has never rung nor come to see me. I’ve tried leaving voice mail, but have had enough. Asked the redoubtable Annie, my housekeeper, for a recommendation. She has suggested Sue Small, a landscape architect in Salamanca Place. I shall ring her. I hate nothing happening to the garden. I want to be able to garden for spring! Sue Small has agreed to come out and inspect both me and the garden. At last, something is happening! For this garden I want very much to get the hard landscaping done right before I start. Once you start the garden, then it is so hard to be able to go back and tear things out and start again. I want the sloping block terraced, I want sandstone (real sandstone, not make believe sandstone), I want raised planting beds and wandering paths, and all the garden accessible by wheelbarrow. And I want compost bins, real compost bins. I have a list and I have photos of gardens I love to show Sue, so she can get a feel of what I want. Sue will be here within the week, and I can’t wait. I wonder how much all of this will cost?? I have got the quote back for the roof. It is a dry mouth kind of a quote, but the roof needs to be done, so I have given the go ahead. Now to schedule a time. This house is eating up the money, and I have yet to start on the garden. 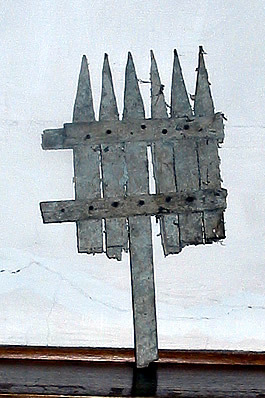 Iron work off and sent away. Four tons of it! I hope it comes back. I have these imaginative little niggling doubts that someone, either the builders or the blasters, will lose it, or make off with it. Nonsuch looks bare without its wrapping of iron lace. 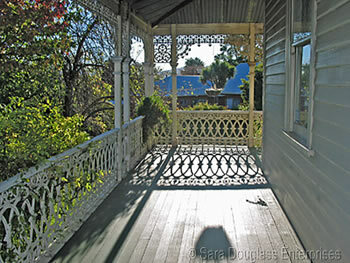 It fact, it looks appalling as now most of the verandah has been pulled down. 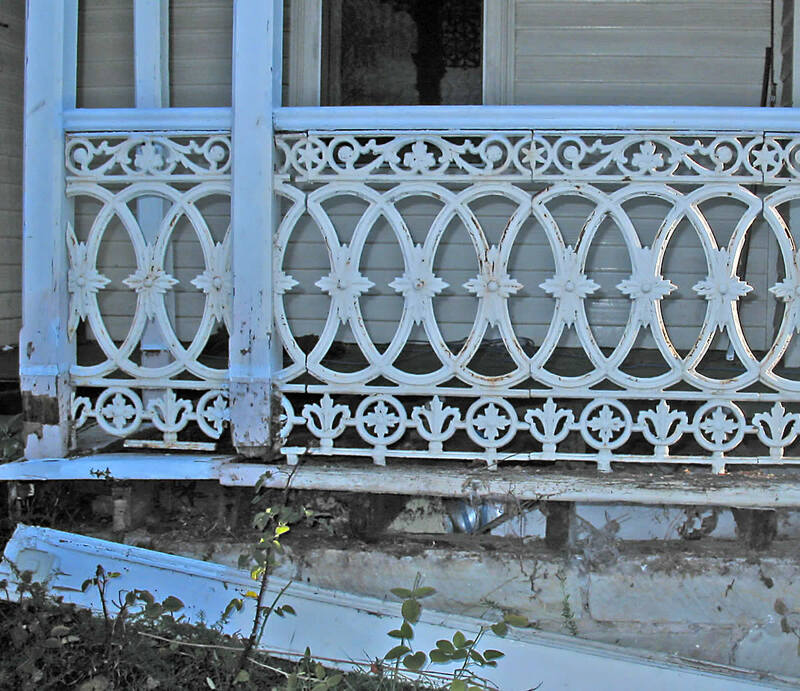 There is so much rotten wood – virtually everything will need to be replaced. Well, Sue Small has agreed to talk on the job of landscaping – full through from plans to work managing the project. Thank God, at least something is happening! Plans will be a few weeks away. In the mean time the verandah continues to be pulled down and more rotting bits of wood discovered. It is very disheartening. The builders are creating a huge mess. I hope they are actually going to clean it up, but they make evasive noises whenever I ask them about it. In the process of raking through the soil beneath the now removed verandah, the builders found this ancient tool – probably a lathe plaster finishing tool – love it! 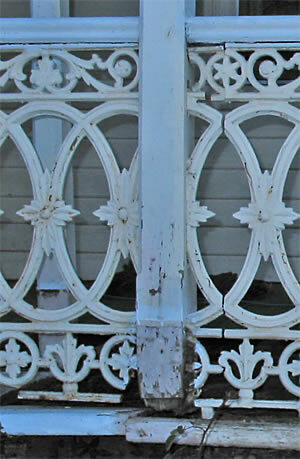 It would date from the time of the house’s construction in the mid-1880s. Note the wonderful cracked lathe plaster in the drawing room, where this photo was taken! The garden is being surveyed for landscaping, although the surveyors cannot get into the jungle at the back! Hopefully soon I will have a survey to show you. Progress, if slow. Nonsuch garden has been surveyed, so now planning for the garden can inch into happening. 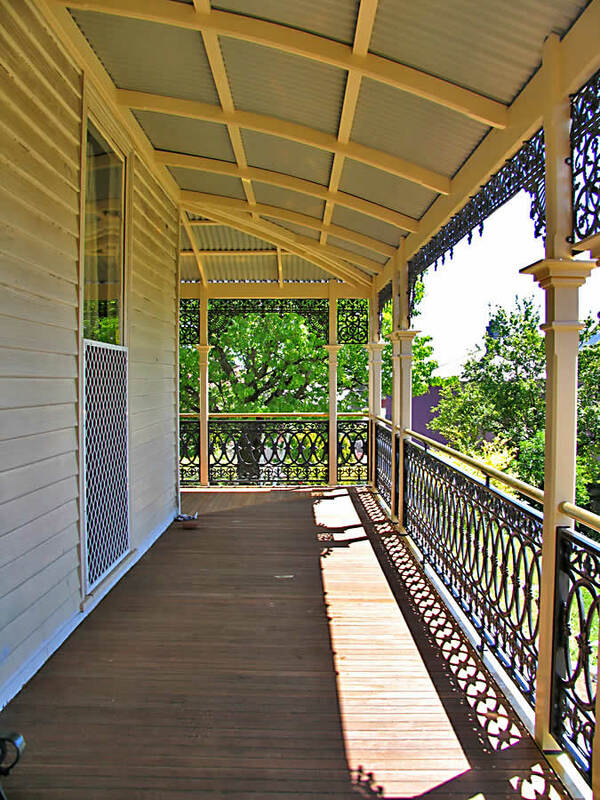 The verandah has largely been rebuilt – although it still looks awful. I’ve ordered in several score vegetable seed packets, as well propagating equipment, for the kitchen garden and am now looking at preserving gear for the kitchen. All these vegetables – will need to do something with them. Have planted out into pots some comfrey and forty liliums – God knows why I ordered those when I don’t have a single plot of garden bed to put them (that the builders won’t walk all over in the first ten minutes). Survey of property as it currently exists (this will open in a new window). You can clearly see the slope of the property … as also the jungle (inaccessible area) I hacked my way through last week! Much excitement! The first concept plan for the garden has arrived. It needs a fair bit of modification, but at least we’re moving! Now when I walk about the mess that was once a garden I can clearly visualize what will happen. I need to order more seeds as I will be doing most of the planting myself. On the weekend I finally managed to hack my way through to the very back of the property. I am still pulling barbs of hawthorn out of my hands and scalp. *ouch* But at least I’ve discovered another half an acre. Well … not quite half an acre, but it is a large area. Saw my first bumble bee in my garden today. I have been waiting for this day with much anticipation. Apparently someone smuggled in an illegal hive from (possibly) New Zealand, and the chubby bumblebee has been spreading slowly but surely ever since. I’ll have to build some bumble bee boxes for them. Much has been happening, but little visible. The garden plan has been all but finalised, and the verandah nears completion. The roofers will be here soon. The garden will have a sweeping brick causeway that links and unifies all elements within the garden. Sandstone and brick retaining walls and paths will terrace the space. There will be no lawn. Not anywhere. Instead Nonsuch shall have great drifts of planting – vast beds of perennials, shrubberies, a flowering meadow, and, to my great delight, a secluded woodland grove of silver birch underplanted with ferns and foxgloves and bluebells. There will be a rose arbor and vegetable beds and compost bays. I won’t be able to start planting until autumn, but that’s okay. Next winter will be a wonderful time of planting, next spring will be too exciting for words. Nonetheless, the planting will take at least three years and I doubt much will look ‘settled’ for about four to five years. To my joy I will have a wonderful horse chestnut tree descended from the one at Ashcotte. Currently the garden looks desperate. Building materials everywhere softened with thigh-high weeds. A charming effect if you go for that kind of thing. The old gnarly roses are now flowering – thus saving their lives. As old and gnarly and leafless they didn’t have much going for them – but now they’ve somewhat desperately sprung into flower I feel a tad more kindly toward them. Again, much has been happening, and little visible still. The roofers are here. They clean up after themselves. I like that. The garden is a nightmarish mess made by the builders. I can’t believe it. Very depressing. I can’t wait for them to leave so that I can have my life and my garden back. I have discovered several very beautiful but as yet unknown shrubs in the garden, and have traipsed about half of Hobart marking out plants in other gardens that I might be able to snip bits off to strike. See a final plan for the garden. I’ve tapped out some ideas re what kind of garden will go where, but until the landscaping is actually done, until I see what is, then ideas remain fluid. Gales last night and this morning. Various bits vanished. Nothing fatal, however, and all trees survived. If I can summon the energy, tomorrow morning before 5 am I am out snipping plants. The landscape plans are all but done, contractors soon to put in quotes (well, soonish), perhaps to start in New Year for a perhaps finish date in April. Lots of perhapses, but it is all suddenly starting to seem very, very real. 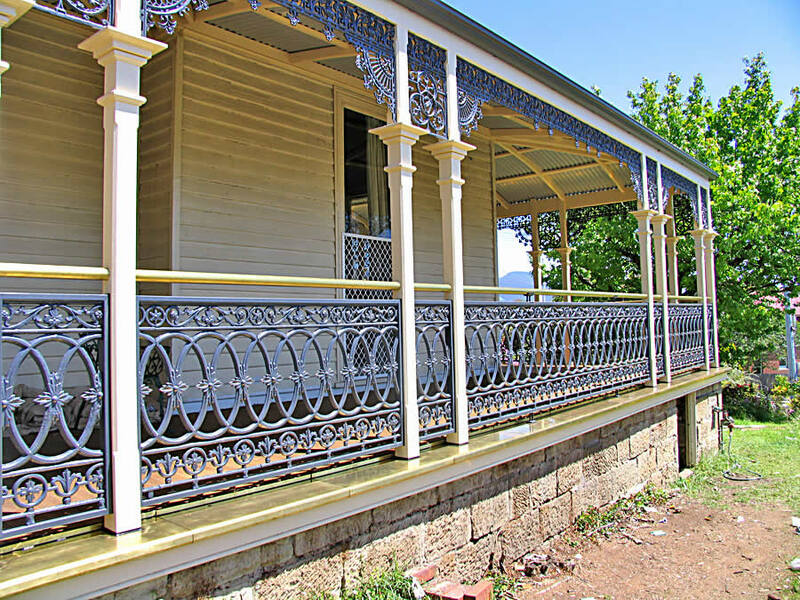 The verandah and roof are almost done – the house looks amazing now the decrepit verandah and roof have been replaced – so much nicer. An old, old lady has suddenly shaken herself and discovered herself elegant once more. Everything has been done in rich creams and shades of grey edged with brass – looks stunning. More cuttings to be cut this weekend – so many shrubs will be needed in the garden! I am having so much fun planning and dreaming. The builders have one more day to work on the verandah. I will be so glad to see them go. They have left behind them the must awful mess – the first time a builder has ever, ever done this to me. Not impressed. A nice man with five more nice men at his coat-tails will be arriving later this week to do what the builders couldn’t – clean up. Then … the lawnmower man can get in and cut down some of the jungle. What I am impressed with is the rain. Over 650 mls since I arrived here – that’s about 300 mls more than Bendigo could ever manage in a year, and I’ve only been here seven months (or at least only keeping rainfall records for seven months). Need to chase up the landscape architect about quotes for the garden. My entire life seems to be taken up with chasing up people who don’t do things on time.